Let’s dive into energy themes and myths. A lot of times, people will think what they do, certain things, are good to promote energy. We’ve talked about fatigue. We’ve talked about the concept of cortisol. We’ve talked about the concept of how imbalance of cortisol and imbalance of fatigue could cause weight gain, can cause distortion of body composition, but there are some real myth out there that we have to myth bust. I know the show Myth Busters is one of my favorite. That’s cool, so we’re going to be myth busters right now. A few myths, caffeine, caffeine gives me energy. Does caffeine really give us energy? 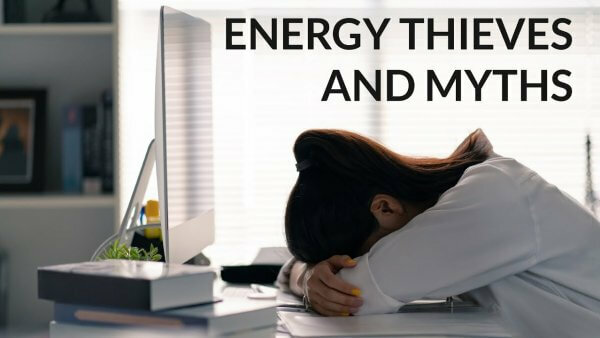 We oftentimes run to coffee, teas, Monster drinks when we feel a little tired, but do we really actually know where energy comes from? We’re going to solve that myth. What about, “I can make up sleep this weekend. I don’t have to sleep all week long, but I can rest on the weekend and catch up”? What about that blood alcohol level that’s going on when we’re not getting the rest that we need during the day? “I need sugar for energy. Carbohydrates, sugar, it gives me energy.” We eat that quick sugary treat thinking we’re going to get more energy, but is that really true? Is that really where energy comes from? Question, where does energy come from anyway, and how do we evaluate it? If you haven’t guessed, these four things are … are they fact, truth, or myths? They’re myths, right. Very good. All right, so there’s some questions, and you’re going to answer these. There’s 10 of them, okay, so I want you to think of 10 lines that you can write on, and it’s going to be in a scale from one to five, one to five. One will be strongly disagree, and five will be strongly agree. You see your 10 questions right there. I want you to go through those things. This is totally on everyone here. Question number one, are you waking up refreshed and ready to go? Question two, is your attitude of thriving and striving decreased? Do you have a lack of focus? Do you have reduced activity and problem-solving skills? Do you suffer from depression or anxiety? Do you have an inability to cope with stress? Have you noticed reduced immunity, for example, frequent colds, coughs, or infections? Have you noticed unusual weight gain? Have you noticed difficulty in making decisions? What about motor skills or cognitive skills? We talked about, earlier, being up too long and how that can affect us. Now, at the end of that, after you’ve rated yourself, if you total up the scores and the score is 20 or more total, 20 or more total, you would say that you are severely fatigued. You have a big fatigue debt. And debt, financially, will do what to you? Don’t you just love that? Isn’t debt just great? Fatigue debt’s real, too. Debt in fatigue base will do what to you? And I’ll take it one more level further. How about wellness debt in general? What does that do to you? If you try to pay back, now watch this transition, if you try to pay back financial debt, minimum payments at a time, what happens to the balance? It grows more. If you try to pay back fatigue debt, minimal payments at a time, what happens to the balance? If you try to pay back wellness debt in general, little bits at a time, what happens to the balance? Y’all with that transition? What would happen if we truly lived debt-free from fatigue, finances, and even wellness? Wouldn’t that be cool? Remember I told you to have a viewpoint earlier at the beginning of session one? This is gonna solidify that viewpoint. I want you to begin to see yourself like that ’cause it’s that important. We got to begin to see ourselves in a place that can be achieved above and beyond our own abilities. Because then it becomes valuable to chase after it. If we achieve something that we think we get in our own abilities, what’s next? We think we’ve arrived. Guess what? This is a journey you don’t arrive at, this is a journey you’re always striving towards. Striving towards, one day, one step, one moment at a time. That’s why this is so important. Let’s look at the power of energy. From the Heavens, the good Lord made the sun and the earth human beings, our bodies are organisms. These organisms have organs in them, liver, kidneys pancreas, stomach, things to do metabolic work. Inside each organ, there are cells, eye cells, hair cells, liver cells, kidney cells, heart cells, muscle cells, metabolically active cells. Well, the bloodstream carries energy to the cells so that they can help create energy. Well, where does energy really come from? The cells must turn these fuel sources into energy in a little organelle that lives inside of your cells. And that organelle is called the mitochondrion, single. Mitochondria, plural. So the mitochondria that you can’t even see, fathom, or know unless you’re looking under an electron microscope is what makes energy for you. And mitochondrion have their own DNA, and that DNA comes from your mother, so it’s expressed in the mitochondria, and those mitochondria help make energy. Let’s start to talk about mitochondria. You just said something pretty cool, it just hit me. I hope you guys got that. Where does energy come from? It starts in the Heavens. Huh? Get this, man, it starts in the Heavens and it goes to the sun. It goes from the sun to the earth. The earth begins to sprout up these plants. The plants somehow end up in our mouths and somehow they go through our mouths, in through our digestive tract, all the way through the cell wall, all the way into the mitochondria. And out of the mitochondria, we have this explosion of oxygen and these micronutrients. And out of that comes energy that our organs begin to operate on so our body can in turn have energy to share. Wow. Think about that just for a moment. Does that not blow your mind? And think about for a moment all of the different areas of disconnection potential. Where is the area that’s mostly disconnected? Probably from the earth to mankind, hand to mouth, would you say? It’s interesting. Think through this as we get into this. This is gonna look incredibly familiar to the session one cell. And we talked about in that idea, in that session, about water needing to go in there. Now we’re gonna talk about micronutrients need to go inside of these cells. In the cells, you see all of these different parts. Now, this is so profound to think about. We’re gonna dive down to the mitochondria. You see the mitochondrion singular, mitochondria plural, in those cells. What does it take to get more mitochondria? It takes more activity. The mitochondria are either fusing or fizzing. If they are fusing together, they’re joining together to create more energy on an as-need demand basis. So, if we’re exercising or pushing our bodies a little bit more and we’re sitting less the mitochondria are gonna fuse. But if the mitochondria, if it’s not being aspirate to create more energy, it’s gonna fizz. Fizz, think fusion, energy increase, think fission, energy decrease. One of the most important things inside the cells is going to be the mitochondria. They’re known as the cells’ powerhouse. Think of these as refineries within. They must function properly to create energy, and to do this, they have to get all of these vitamins, minerals, and enzymes into the cell, which come from our environment. Which also require oxygen, which comes from the environment. If we’re not able to get oxygen in, and we’re not able to get these vitamins and minerals and enzymes in, what’s going to happen to the ability to push energy? Is it gonna go down or up? It’s gonna go down, that’s right, so energy, remember, once it’s created, it moves from this tiny organelle throughout the system. Then it’s moved from the organ system so they can operate efficiently. Without energy, the organs die. The organs themselves function, get this, to make the organism function or operate. What an amazing system we live in. So, energy doesn’t come from coffee. It actually comes from the health of our mitochondria, so let’s dive into the mitochondria. They’re our powerhouses, they’re the powerhouse of the cell. These mitochondria, they have an inner membrane, and on that inner membrane there is what’s called an electron transport chain. That electron transport chain has to have certain nutrients in order to end up as ATP or energy. The mitochondria also have an outer membrane. Remember we talked about cellular health? And one of the components of cell health was omega 3 fatty acids? Well, guess what the mitochondria need to have a healthy outer cell membrane? Omega 3 fatty acids. Then, in the cytosol and in the matrix, that’s the spongy, thick gooey stuff that’s inside the mitochondria, certain chemical reactions go on in order to make energy. This thing we called energy, also in the biochemistry books known as ATP, or adenosine triphosphate. ATP fun facts. Fun facts are awesome. How many know that at rest, doing nothing, the average adult male will need this incredible number, three times 10 to the 18th power molecules of ATP per second for normal organ functioning? Someone say that’s a lot. Get your iPhones out and start calculating that number you won’t have enough zeros. Basically, the body produces enough ATP, adenosine triphosphate during the day that equals the weight of an average adult. And I find it fascinating, so the whole body content at one time’s about 250 grams. And then the brain, the brain, someone say brain power. The brain uses 20 to 25% of all ATP production. So if … This is a question for you I want you to think through. You’re gonna become functional medicine experts in your life … If you begin to have brain fog, is it a brain problem or is it a mitochondria problem? Probably a mitochondrial problem because the brain, get this, and it’s not in the slide but I want you to understand, the brain has mitochondria, of course, but it has less mitochondria per capita compared to the other three energy-using organs, the heart, the liver, the kidneys. It has less mitochondria than those three organs combined but yet it has more energy output. The mitochondria inside the brain use more energy faster and those mitochondria are more in need of it. It’s a powerful thing. The brain goes first when we start having mitochondria dysfunction. So you hear this again and again, food is medicine. What’s the most important medical decision that we make every day? At least three times a day? Is what we put at the end of our fork, because that is what goes through our digestive tracts into our bloodstream, down into the cell, to the mitochondria, to actually make energy. Food is medicine, it’s connection, how we connect with other people. It’s cellular connection, how the cells connect to each other and provide information. And then transform all of the molecules that come from food into energy. How is energy transferred? How is it made? Remember that little circle we had earlier where we … Revisit it again a second. Dr. [Michelle], take us through what happens in these particular little reactions here? Well, proteins, fats and carbohydrates, they are all converted into what’s called the ATP pool. And inside the mitochondria, your body will take these molecules and put them into processes like glycolysis, the Krebs cycle, and the electron transport chain. And each one of these processes requires very specific nutrients in order for that to happen. It kind of looks like this. Here we are again. Remember? The top line contains the fats, the carbohydrates, and the proteins. Those are called what? Micro or macro nutrients? Macro, think big, and they’re broken down, so there’s a process that breaks down each of them. Proteins are broken down via a process called deamination. I didn’t say damnation. I said deamination. It’s a good way to remember it, though. Carbohydrates are broken down by something called glycolysis, glycolysis. Fats are broken down by something called beta oxidation. We want to learn to be beta oxidation experts, because that begins to say something like this, fats begin to be used as our primary source of fuel. Primary source of fuel.